Eric Holthaus/Twitter/NOAAA satellite image of the nor’easter hitting the East Coast on the morning of March 2, 2018. 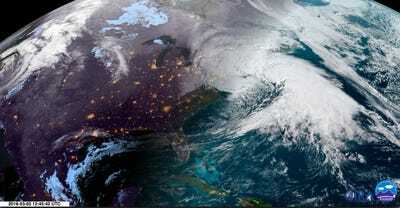 On Friday morning, a powerful nor’easter began barreling through the United States East Coast. The National Weather Service has warned that the storm is a “life and death situation” for those living on the coast. Winds are expected to reach speeds up to 50 mph. The storm – which may reach as far south as Georgia – could knock out power, flood neighbourhoods, and damage homes up and down the coast. A nor’easter officially hit the US East Coast on Friday morning, and is expected to affect coastal cities from Georgia to Maine. Like the powerful storm that slammed the East Coast on January 4, meteorologists are describing this new nor’easter as a “bomb cyclone.” The term essentially means that the barometric pressure is dropping quickly. Forecasters say that the nor’easter could knock out power, damage or destroy homes, and flood neighbourhoods up and down the coast. New York could see 10 inches of snow or more, and some parts of New England could get three to four inches of rain. Due to worries that the storm could delay flights, airlines including American, Delta, JetBlue, United, and Southwest have put out warnings, and are allowing customers to change their Friday and Saturday reservations.